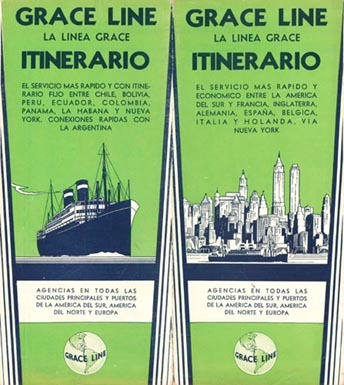 From the 1890s until the late 1960s, The Grace Line was a major devision of W.R. Grace Inc. Their first class liners operated from New York to the Caribbean, South America, Mexico and the West Coast of the USA. They were one of the last American flag liners or cruise-ships operating. 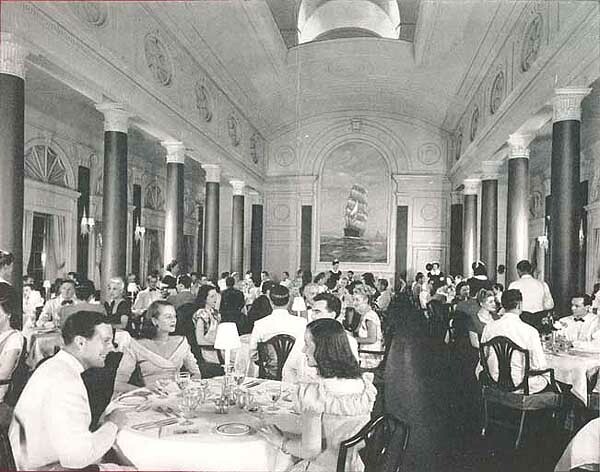 Dining Room aboard Grace Line ships. The ceiling opened up to the upper deck, stars and heavens. In the mid 1800s, the Irish-born Grace brothers, William Russell and Michael, established a commercial and shipping business in Callao, the port of Lima, Peru. They prospered, especially in the exporting of guano from the Chincha Islands to the United States, where this fertilizer was in considerable demand. In 1865, leaving Michael in charge of their interests in Callao, William established the firm of W.R. Grace & Co., in New York. By 1880 he had become a leading citizen and was twice elected Mayor of New York, despite opposition from Tammany. In the 1890’s the company entered the steamship business with a line of freighters running from New York to the South American west coast via the Strait of Magellan flying the British flag. In 1865, leaving Michael in charge of their interests in Callao, William established the firm of W.R. Grace & Co., in New York. By 1880 he had become a leading citizen and was twice elected Mayor of New York, despite opposition from Tammany. In the 1890’s the company entered the steamship business with a line of freighters running from New York to the South American west coast via the Strait of Magellan flying the British flag. Grace’s original British-flag ships had black hulls, white painted masts and booms, and a green stack with a black top. After the First World War successors were painted grey, with masts and booms of the usual mast color. Hulls became black again in 1928 and masts and booms reverted to white in 1932. 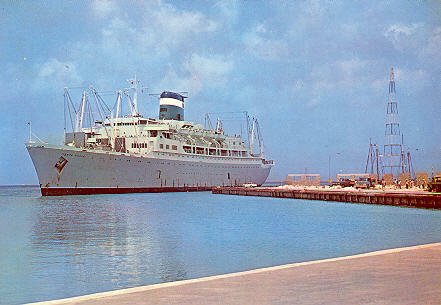 (about 1959-60 Grace passenger ships again turned to grey hulls). Later Grace started a service from the Pacific coast of the United States to the west coast of South America, and in 1913 took delivery of the 4,826 gross ton, 400-foot Santa Cruz from William Cramp & Sons of Philadelphia for this run. She was their first American flag ship and was especially designed to carry a large deck-load of lumber, as well as 48 passengers. three boilers provided steam for a 2400 horsepower triple expansion engine, which gave her a speed of 11-12 knots. She introduced the green funnel with white band and black top which continued to be the Grace stack colors. COLUSA, of 5873 gross tons and 424 feet, was also built in 1913, by Hamilton of Port Glasgow, Scotland, for the same service as the SANTA CRUZ. She was Grace’s last ship for British-flag operations. Three boilers and a quadruple expansion engine of 3500 horsepower gave her a service speed of 12 knots. She too, was built to carry large loads of lumber on deck. She had four masts at first, but was later given a fifth with a 100 ton boom, and handled fully assembled steam locomotives for the South American ports. Her 36 passenger capacity was later increased to 50. To restore Transpacific service, Grace bought in 1915 three ships under construction in Holland; Colombia, Ecuador and Venezuela, laid down for the Royal Netherlands West India Mail, these had been intended to run down to the west coast of South America via the Panama Canal, but had been sold on the stocks to the Norwegian owner Chr. Hannevig, who proposed to use them between New York and the South American east coast, a run discontinued by Lamport and Holt and Booth Line because of the war. Hannevig, however accepted Grace’s offer to buy the ships before they were completed. Colombia kept her name until she was lost. This unlucky ship first ran aground on Cano Island off Costa Rica in 1923, remaining there two months. Practically her whole bottom had to be removed in drydock at Balboa. In the fall of 1931 she went to her grave on the south end of Margarita Island off lower California. Venezuela struck a mine on the way out from Holland and was repaired in England. 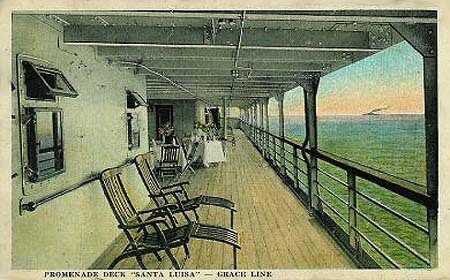 In 1916 Grace decided to institute a passenger service from New York to ports on the west coast of South America as far as Valparaiso, Chile, and contracted for five ships; SANTA ANA, SANTA LUISA, SANTA TERESA (By Cramp) and SANTA ELISA and SANTA LEONORA (by New York Shipbuilding). These 110 passenger ships were 376 feet long with a gross tonnage of 5800. They had four boilers each and quadruple expansion engine of 3300 hp. in the Cramp ships and 3400 in the others. Their service speed of 13 knots could be exceeded by a knot. COLOMBIA, ECUADOR and VENEZUELA were thus displaced and in the following year were transferred from the far east run to the inter coastal run. At the same time Grace placed on the same run the freighters SANTA BARBARA, SANTA CLARA, SANTA MALTA, SANTA OLIVIA, SANTA PAULA and SANTA ROSA. These six , making connection with the President ships at San Francisco, provided fast freight service from Atlantic ports to the far east. 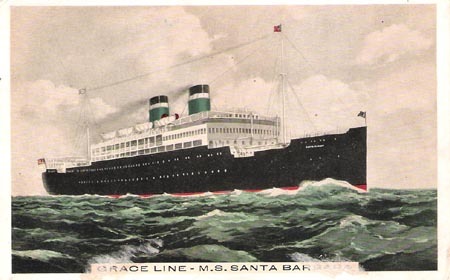 In 1928 to meet competition from the Pacific Steam Navigation Company and the Chilean Line, Grace took delivery of SANTA BARBARA and SANTA MARIA, which were a great improvement over previous ships. As it was then permissible to build ships in foreign countries for U.S. flag operation and retain eligibility for mail contracts, these sisters were constructed by the Furness Shipbuilding Company in Haverton-on-Tees, England. Each had two 8-cylinder, 2 cycle Sulzer diesel engines of 4000 hp. apiece. They were the first large motor passenger ships to sail under the U.S. flag. 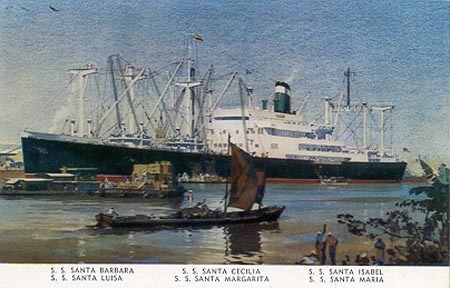 Since only four ships were required for the Valparaiso service, SANTA ANA and SANTA LUISA were transferred to the Panama Mail’s New York-San Francisco run and were renamed respectively GUATEMALA and EL SALVADOR. In 1929 SANTA INEZ and SANTA RITA joined the fleet. Apart from cruiser stern, short funnel and diesel propulsion, these ships built by Burmeister & Wain of Copenhagen, were much like the SANTA ANA class. Measuring 5000 tons and 386 ft. overall, they had accommodations for 125 passengers in two classes. Each had two six cylinder, 4 cycle, 3600 HP main engines, giving a service speed of 13 knots. SANTA RITA made 15.1 on her trials. This pain joined SANTA CECILIA and SANTA CRUZ in Grace’s secondary service which was now extended to Valparaiso. 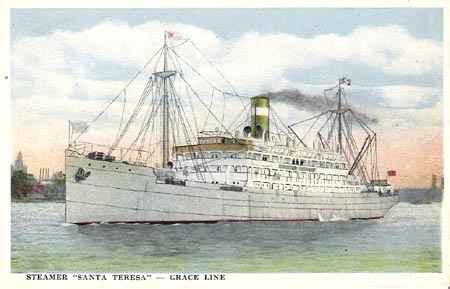 Upon COLOMBIA’S loss in 1931, the Grace ships SANTA ELISA and SANTA TERESA were transferred to Panama Mail, in order to have four vessels of the same capacity and speed on the New York San Francisco run. 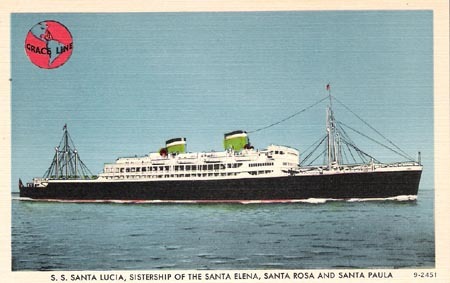 ECUADOR and VENEZUELA, respectively renamed SANTA OLIVIA and SANTA ISABEL took the place of these two on the secondary South American service EL SALVADOR was renamed SANTA ANA and GUATEMALA, SANTA CECILIA. The previous SANTA CECILIA had been sold to Norway. To comply with its mail contracts, Grace had agreed to build four new ships. These the SANTA ROSA class were ordered from Federal Shipbuilding Co. Kearney, New Jersey and delivered in 1932-1933. They were designed by William Francis Gibbs, who had also drawn plans of Matson’s MALOLO and later to draw those of the AMERICA and the record-breaker UNITED STATES. Their power plants were at the time second to none in efficiency. Each of the water tube steam generators with a pressure of 430 lbs. produced 6000 hp. and each ship could make 18-1/2 knots with only three boilers active. The main engines were double reduction turbines. The screws turned inward, and for this reason were very awkward to maneuver. The passenger capacity of the SANTA ROSA class was 209 in first class and about 50 in steerage. 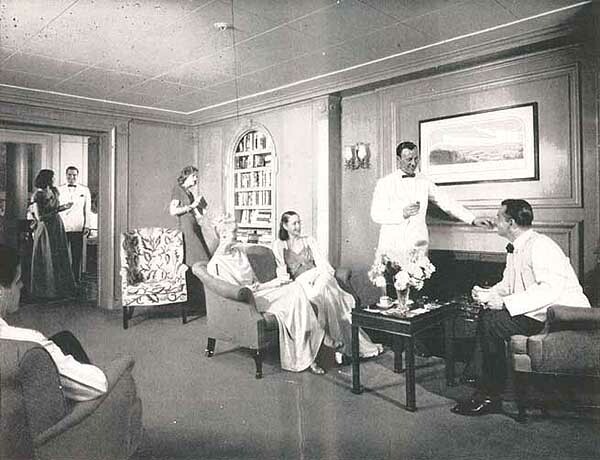 Their public rooms were all on the promenade deck, with the dining salon extending two and a half decks in height to a roll back dome. The after dining room bulkhead was adorned with a large oil painting of a Grace clipper. Each cabin, whether single or double was equipped with private bath. In 1934 the port time in New York was greatly reduced and the call at Philadelphia eliminated. The time saved enabled the ships to make a shuttle run between Seattle and San Francisco. The 20 knot service and the ship’s superior accommodations to anything the Pacific Coast shipping had to offer made this an exceedingly popular run. 1936 Grace acquired the Red D Line and it’s Caribbean Service, and early in 1937 SANTA ROSA, SANTA PAULA and SANTA ELENA entered that service: New York to Venezuela, Curacao, Colombia, Cristobal and Haiti. In addition to the services already mentioned, Grace operated several cargo runs, for which it built eight 12 knot freighters, between 1913 and 1919. These all of about 10,000 deadweight tons. They were the SANTA CATALINA, SANTA CECILIA and the six already mentioned as running inter-coastal in the early 1920’s. There was also a 13,000 ton tanker NORA, named for the daughter of J.P. Grace. all these freighters had been sold by 1925 and the tanker was disposed of in 1932. SANTA CATALINA by 1919 had become the USS BLACK HAWK, a destroyer tender. The Government had six uncompleted C2 type hulls and these were offered to Grace Line. Grace Line accepted the offer and had them converted to 52 passenger vessels. These “combos” became very popular and were a huge success and Grace Line had three more built. The first six were fitted out to carry bananas from Ecuador to New York. The last three were to be on the Caribbean run and were not equipped to carry bananas. Graces postwar fleet consisted of the nine combos, the Santa Rosa and Santa Paula, (which had been returned to Grace Line and refitted again to the liners that they once were) and nine C2 freighters. 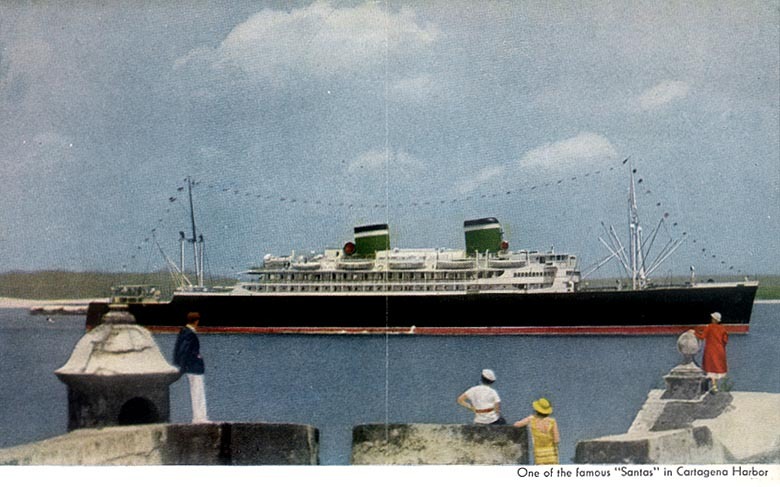 The Santa Rosa and Santa Paula served the Caribbean calling at Curacao, La Guaira, Aruba, Kingston, Port au Prince and Port Everglades, sailing from New York every two weeks. The three Caribbean “combos” called at Santo Domingo, Puerto Cabello, La Guaira, Maracaibo, Barranquilla, Cartagena, Baltimore, Philadelphia and New York. 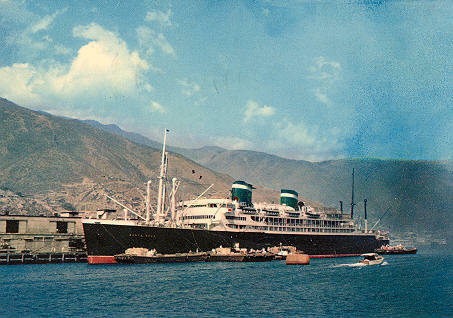 The other six “combos” along with the C2 Freighters sailed from New York to the West Coast of South America as far as Valparaiso. In 1960 Grace Line decided to replace the aging “Combos” with four new 20 knot passenger vessels to carry approximately 100 passengers. These vessels were to serve the west coast of South America. They were 20,000 displacement tons 546 feet long with a 79 foot beam. The names were chosen to honor the four countries, Panama, Colombia, Ecuador & Peru They were designed with all new advanced cargo carrying devices. Each was fitted out to carry 360,000 cubic feet of bananas (90,000 stems approx. 4000 tons) in three holds, on the southbound voyage these areas were used for carrying autos or palletized cargoes which were loaded by a special pallet handling system. There were 5 cargo elevators in 3 holds. The other two holds were container holds. There were four gantry cranes on deck which when married in pairs could handle 40 foot containers. Container capacity was 175 twenty foot containers. The four “M” ships, as they were called carried 125 first class passengers. 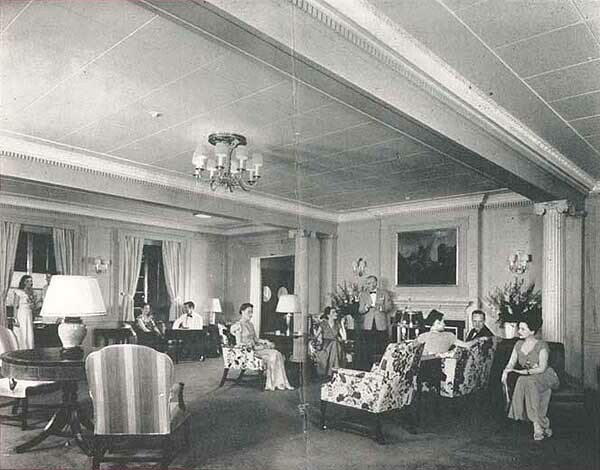 Public rooms were spacious and tastefully decorated and there was a large outside tiled swimming pool. About this time Grace decided to replace the aging freighters and six new freighters were built, The first of these was the Santa Lucia and these ships became known as the “L” ships. They were modern vessels with refrigerated compartments for Chilean fruit and Ecuadorian bananas. They were equipped for 12 passengers in luxurious staterooms and had seven hatches with 10 ton booms and two 30 ton booms and a 80 ton jumbo boom. Things were normal until 1969 when the parent company W.R. Grace decided to go out of the steamship business and concentrate on chemical and other company ventures. Grace Line was sold to Prudential Line, a small line owned by Skouras of 20th Century Fox. At first the line was called Prudential Grace Lines and later the Grace was dropped and it became just Prudential Line. 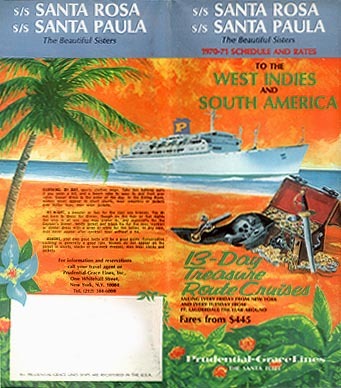 The ships were operated as before with most of the same personnel aboard but in 1970 Prudential decided to suspend the Caribbean service and the Santa Rosa and Santa Paula were laid up, never to sail under the American Flag again. The “M” ships were sailed as freighters until 1972 when three were transferred to the west coast. They were once again returned to passenger ship status. They sailed from San Francisco, north to Tacoma and Vancouver thence through the Panama Canal calling at ports on the east coast of South America then through the Strait of Magellan to call at ports on the west coast of South America and thence return to Los Angeles and San Francisco. This was a 59 day voyage. The Santa Magdalena remained on the east coast until 1974 when she too was transferred to the west coast to sail with the other three. In 1978 the Prudential Line was taken over by Delta Lines, In 1983 there was a sharp drop in cargo bookings to South America and operations began to wind down. The six “L” class freighters were laid up and finally sold. The four “M” ships continued to run until 1984 when all operation of the former Grace Line Santas ceased. Next: “EVITA” CRUISE HISTORY: Does Madonna know that Eva Peron had two ships named after her?